About three weeks ago, just a few days before heading out on our vacation, I noticed a black spot in the vision of my right eye, modestly to the right of the center of my vision. that fluid shrinks as you age. But in my brain that fluid is rather more liquidy than it apparently is in reality. In my actual eyeball, that fluid is so gelatinous that it is attached to the retina with strands of connective tissue. My vitreous had shrunk enough that one of those strands pulled free, and the strand (connected to my vitreous and no longer connected to my retina) is what I’m seeing. Or rather, the shadow of that strand is what I’m seeing. They call it a floater, but this one is unlike other floaters I’ve had. The other ones floated—that is, they moved around. This one is fixed in place. The others were also translucent, whereas this one was black. Looking out was rather like using a screen with a few dead pixels. The prognosis is good. 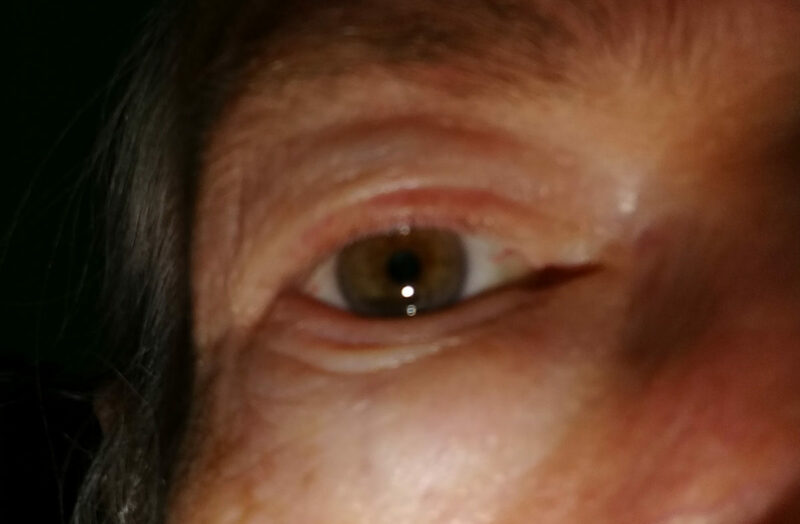 The black spot should become less noticeable, through both my immune system scavenging up the no-longer needed connective tissue and my brain learning that there’s no information in the black spot and filling in with detail from my other eye. (The spot is already turning browner and translucent.) There’s a slightly increased risk of retinal tears and detachment, not from the floater itself but from the shrunken vitreous. I asked if there was anything I could do to encourage the vitreous to regain it’s original size, but apparently there isn’t anything known to hep with that. The doctor said that it was often recommended that people refrain from heavy lifting, and I actually did quit lifting during the couple of days before the trip and the duration of the trip itself, but I’m certainly not going to give up lifting. Because of my tendency to worry about such things, it was kind of daunting to have this happen right before our long drive, but in actual event was a non-issue. I’ll update if anything more comes of it.